If you are travelling to Budapest from the UK or Republic of Ireland to visit us at Evergreen Dental, you may need to purchase travel insurance. 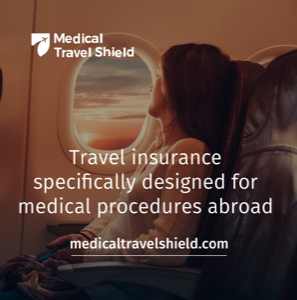 Medical Travel Shield is a specialist single trip travel insurance that will cover your trip. Benefit is provided for standard travel insurance expectations as well as additional benefits for your procedure. Please click on the banner to visit their website and find out more. The guarantee policy is one of the main aspects to consider when choosing a dental clinic as it indicates the quality of the work and materials to be expected. Our policy strongly differentiates us from other dental clinics especially on us putting a big focus on dental implant aftercare. Evergreen Dental is offering the most complex guarantee compared to other dental clinics in Budapest as we feel confident about the quality of our treatments and the work of the dental technicians, coming from our master laboratory. We would like to emphasize though that the longevity of your new teeth is largely dependent on you, as with appropriate oral care and handling you can do the most for the maintenance of your smile, far beyond the guarantee period. In case of a guarantee case, the travel costs will be covered by us according to our guarantee policy to be read below! The prerequisite for the guarantee to be valid is attending annual checkup and a dental hygiene treatment. These can be done at any dental clinic or surgery in your home country (X-ray required) but we also offer these services to our patients at a special price as the thoroughness of the aftercare is just as important to us as carrying out dental works. We will advise you how to best care for your new teeth. Circumstances that can endanger the longevity of dental work are mainly allergies, diabetes and heavy smoking. In these cases, two annual checkups are obligatory for the guarantee to be valid, and one of them has to be done at our clinic. With some existing risk factors, we can’t offer a guarantee at all but we will always inform you of this beforehand, it in writing. For removable prostheses, improper cleaning invalidates the guarantee. The guarantee becomes invalid if the dental work has been changed in any way by the patient or a third party, or in case there are damages of any kind due to improper handling or exposure. Furthermore, we reserve the right to have the dental work examined by an independent expert witness. The guarantee covers necessary repairs or reproduction of the dental work. The guarantee does not include plastic and composite parts, temporary solutions and extensions or linings of the prostheses as well as any future root canal treatments or treatment of infections/inflammations. Evergreen Dental is not liable for future complications that were not visible or predictable on the X-ray or during the consultation and treatment at Evergreen Dental. In case of works being carried out by a partnering dental clinic (for instance final fixation of a bridge), we can make a co-payment of up to 100€. In order to be able to maintain your dental work for the longest possible time, we give you specific, professional recommendations. WHAT HAPPENS IF I HAVE A GUARANTEE CASE? According to a study carried out by the Hungarian Semmelweis University and the University of Oxford, only 5% of dental patients need to take advantage of the guarantee offered by their dental clinic, in Western Europe. In Hungary, this rate is even lower at 2,7%. This shows though that even with optimal planning and execution the possibility of a problem occurring can never be fully excluded. It is of crucial importance how the problem is being dealt with. Initially short description about the problem and pictures of the damaged part shall be sent to our clinic via our contact form. If a return to Budapest is necessary we will examine the dental work in order to determine why the malfunction happened and apply the guarantee reimbursement as described above if applicable.